What Options and Features Should an Air Compressor Have? I don’t know about you, but when I decide to buy something (in this case an air compressor) I tend to pay attention to all the important bits such as size, power, CFM, and portability. That’s fine but once you get past that you still want to get the best unit for your money, so if you’re anything like me you start looking at extra features that might make your purchase even better. Now getting more bang for your buck is fine, but some compressor features are necessary regardless of the cost even if they aren’t what you would call essential. As you can imagine there are plenty available. Just figuring out the most basic stuff on air compressors takes ages, and it will take you even more time just to get a grip on all the bells and whistles that come with it. So I have decided to make it easy on you by adding this page to my website. There are so many however, I’ve only included options I think are definitely worth considering. Some of the compressors I have reviewed here have a roll cage. What the roll cage does is protect the vital components of the compressor from getting damaged. It is even better when the controls are inset from the frame of the roll bar. A good roll cage should have a low center of gravity so you can’t knock it over by accident. During continuous use, the friction between mechanical components of the compressor generates heat which can damage the entire unit if it exceeds a certain value. As a measure of precaution, some air compressors have a thermal overload protection mechanism which cuts power to the motor in case the compressor starts to overheat. A pressure switch shuts the motor down once pressure inside the tank reaches a specific value, and it will turn it back on when that value goes below a specified number as well. This takes the hassle out of knowing when you can use the compressor safely again. This is something that is more at home on an air purifier, but it does come in handy on a compressor as well. An air filter on the intake end will capture all contaminant particles present in the air. These particles are really small, but if their concentration increases they can damage the compressor especially if they contain moisture. The filters usually come in the shape of a replaceable air filter, or oil bath. Seeing as the air contains some moisture which can collect inside the tank over time, a drain valve is needed in order to drain the excess. Moisture can damage the compressor components especially if they are made out of cast iron, so it’s better to have a feature like this which you can rely on. If you are looking to buy a portable compressor, there are some features you need. Some compressors out there are stretching the term “portable” pretty thin (sometimes weighing close to 100lbs). Not exactly something you would pick up in your hand and carry around from location to location is it? 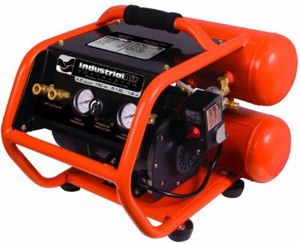 You should look for a compressor which has a carrying handle or handles for starters. If you can, find out about the compressor’s weight distribution. Often, compressors feel much heavier than they are due to poor weight distribution. 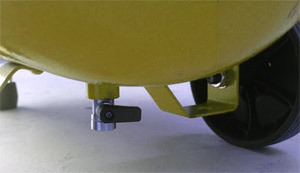 If the compressor is too large, has a vertically oriented tank or both, try and look for a model that is fitted with some transport wheels that allow you to push or pull the compressor. If you opt for a compressor that is stationary, make sure it has rubber feet. Not only do they reduce some of the vibration, but they also protect your floor from getting scratched if you are using the compressor indoors. These features are not of crucial importance, but they are very convenient and nice to have on your compressor. While you can do without some of them, I would suggest you look for a compressor that at least has a drain valve and pressure switch.